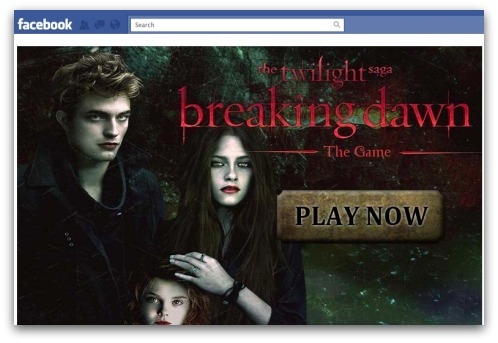 Be warned, if you’ve been tagged on Facebook or seen a link promoting a Twilight: Breaking Dawn game, be cautious. This is not a game at all, but a scam quickly spreading through Facebook. Users who click on the link will have their personal data and account compromised. Clicking on the link will invite you to start playing the fake game. For users using Facebook on HTTPS, you will be firstly prompted with a dialog box to switch to a regular connection, this should set off some alarm bells for users. This scam makes you “Like” the fake game without your permission and will thus post it on your Wall, allowing other users to see it and be inclined to click on the link. For any fans of “Twilight” you could possibly grant permission without thinking. This is how normal scams work, they take a popular event or object that most of their targets enjoy and exploit it. The only problem with this is that this isn’t a legitimate application, the rogue app only wants to make money out of your obsession with the Stephenie Meyer series of novels. For users that end up clicking on the link, the game will ask you to give permission to the app, and then it will direct you to a questionnaire that wants you to give out personal data. As a security measure you should avoid clicking on any link that proves to me suspicious and you should always dig deeper and verify the app before giving it additional permission. User that have already fallen prey to the scheme should go and delete any spam posts that have been already posted, Then go through the security settings and revoke any apps that you don’t recall giving permission to. Next articleAnyone Want An Ad Supported Amazon Kindle?